If you’re looking at improving the use of factory or warehouse floor space, adding a new room or storage area, streamlining production and increasing productivity, then Industrial Partition Systems, industrial partitioning and steel partitioning specialists, are happy to help. We offer a free of charge, fixed price quote on all industrial partitioning projects and our team will be happy to help with any questions you may have. To arrange a site visit, or to simply discuss a question over the phone, call us on 0115 736 5986 and we’ll be glad to help. In a world where floor space is a costly item, everyone wants to make the best possible use of what they have. After-all relocation costs to larger premises are spiralling, to say nothing of the increase in monthly overheads. Using industrial partitions and a little reorganisation can free up that extra space you didn’t realise you had, or help streamline operations and increase productivity of your existing layout. Industrial partitions in warehousing can be used to create offices, archive storage areas, provide temperature controlled areas, totally sealed areas including airlocks, secure storage areas using mesh partitions, and storage for individual products. If our demountable industrial partitions are used, the system becomes one of flexibility, where offices or storage areas can be removed and reconfigured as required. Using industrial partitions in factory floor areas can help improve the working environment for employees, and hence productivity. Areas of production which are noisy, or produce large amounts of dust or fumes can be isolated, and supplied with their own extraction systems. 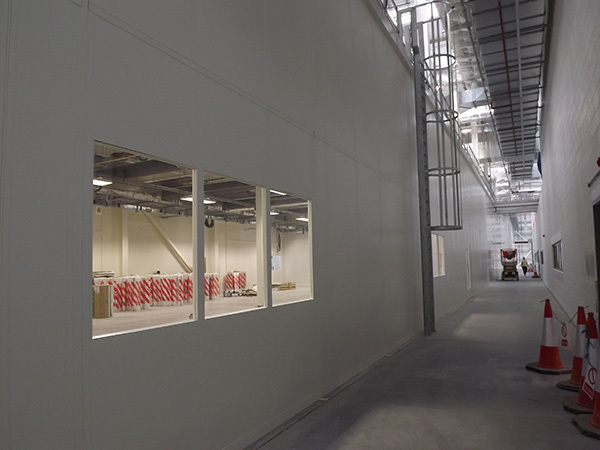 While the correct type of industrial partitions are effective against both noise and air pollution – including demountable partitions in the design allows for a level of flexibility when production requirements change, or new processes come online. If your factory or warehouse set-up has remained the same since you began trading all those years ago, or you’re about to fit out an empty warehouse or factory floor, consider incorporating industrial partitions within the design, and make the most of your available floor-space. Call us on 0115 736 5986 to discuss your options.